I rarely shoot this wide because it looks like all the buildings are falling into each other haha. However, if you want all the buildings in one shot so close, there isn’t much choice. I shot this one in Chinatown in Calgary, Alberta Canada. 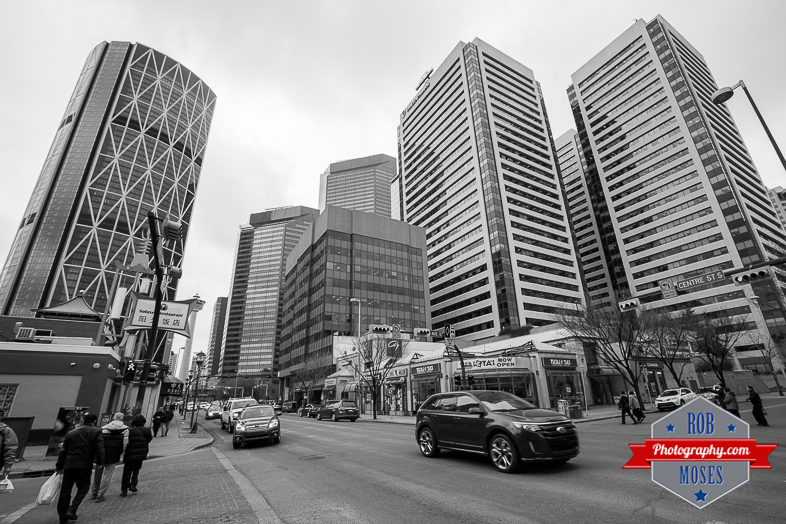 This entry was posted in Cities and tagged 16-35L, 16-35mm, 5D mark iii, 5D3, 5Diii, Alberta, Black & White, bow, building, buildings, Calgary, Canada, Canon, car, Chinatown, city, City Life, ford, metro, people, photo, Photography, scene, sky, skyscrapers, street, street photography, SUV, tower, ultra, ultra wide, Urban, wide, yyc, zoom. Bookmark the permalink. I love this, I know I have the same issue with buildings. PS Elements 12 has a way of correcting it, but as of this moment I have not tried it yet. I rarely pull out Photoshop now that I am using Lightroom. Than you 🙂 There is a lens correction in LR too, but i’m sure you’ve already tried that. I find it doesn’t make much difference when shooting this wide haha. Anyhow, thanks for stopping by and commenting Deborah! See you around ;).